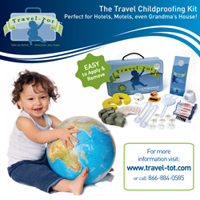 Travel-Tot: Summer Safety: 4 Lifesaving Recommendations! Summer Safety: 4 Lifesaving Recommendations! We all know that summer is a great time to get out and have some fun! What you may not be aware of, however, is that summer is marked by a dramatic increase in accidental injuries and deaths among young children (aged 14 and under). Data collected by Safe Kids Worldwide demonstrates that during summer months there is a marked increase in unintentional injury-related deaths attributed to drowning, biking, falls, and motor vehicle occupant activities among young children. General: Always actively supervise children near water. Begin teaching children to swim at age 4. Teach children never to swim alone and never to dive into water less than 9-feet deep. Obey all posted safety precautions at beaches and pools. Pools: All pools should have a locking, gated, 4-sided isolation fence (preferably one that affords visual access, i.e. fine wire- or poly-mesh, wrought iron, etc.) Door alarms, pool alarms, anti-entrapment devices and pool covers can also provide an additional layer of protection when used properly. Open Water and Boats: Be sure children are equipped with appropriately sized life jackets approved by the U.S. Coast Guard when on boats, near open bodies of water, or when participating in water sports. General: Make sure children wear snug, properly-fitting helmets at all times when biking or riding scooters or skateboards. Be sure children are using properly sized equipment (i.e. on a bicycle, your child's feet should touch the ground when they are sitting on the seat). Teach children the rules of the road and be sure they obey all traffic laws. Be a good example; when riding be sure you always wear a helmet and demonstrate proper etiquette and obey the law and all posted regulations. Windows: Keep chairs, cribs, changing tables and other furniture away from windows. Install window guards on all windows above the first floor. Don’t allow children to play on balconies, roofs, or near open windows. Playgrounds: Actively supervise children at playgrounds. Make sure they use only age-appropriate equipment. Be sure playgrounds have soft-surface coverings (i.e. rubber, hardwood fiber mulch or fine sand) at least 12 inches deep, extending a minimum of six feet in all directions around the equipment. Sports: Make sure kids wear appropriate protective gear, properly fitted when practicing and playing sports. Car Seat Safety: Properly restrain all children ages 12 and under in a back seat on every ride. Secure infants in rear-facing car seats as long as possible, and at least until they are 12 months old and weigh 20 pounds. Secure children who weigh between 20 and 40 pounds in forward-facing car seats. Secure children over 40 pounds in belt-positioning booster seats until an adult seat belt fits properly (at least 4' 9" tall and 80 to 100 pounds, for most children that's between ages 8 and 12). Driveway/Garage Safety: Walk all the way around a parked vehicle to check for children before entering a car and starting the motor. Toys should not be kept near parked cars as they can lure a child into a driver’s blind spot. Entrapment/Heat Stroke/Suffocation: Never leave a child unattended in a car, even if the windows are open. Always keep your car locked. Keep automobile keys out of children's reach and sight. Make sure vehicle trunks are locked at all times. Keep rear fold-down seats closed so kids won't crawl into the trunk. Have your car retrofitted with a release mechanism inside the trunk. Wishing you and your family a safe and happy summer! 2 Great, Cheap Travel Apps! Tips for Successfully Traveling with a Group! Kidecals: The Verdict Is In! Blogs We Love: Safe Sound Family!